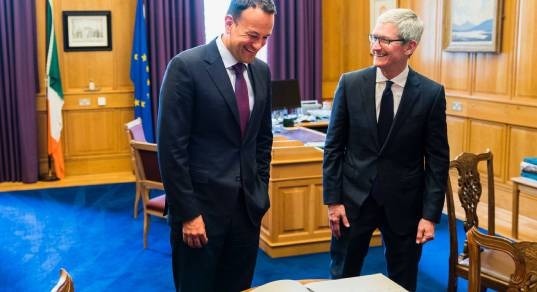 Cook is currently on a tour of Apple's European operations, and on Monday night took an opportunity to meet with Taoiseach (head of government) Leo Varadkar in Dublin, Cork's Evening Echo reported. The publication didn't say what the pair discussed. In a statement, Apple highlighted the fact that it's Cork's "largest private employer," and that it remains the home of the company's only self-owned factory, which builds custom-ordered iMacs for Europe, the Middle East, and Africa. Apple has had a presence in Cork since 1980 and currently employs some 6,000 people there. The company's Irish workforce has doubled in size during the last five years, the Echo noted, and the Cork campus expansion will provide room for 1,400 workers. The company was originally drawn in by factors including a 10-year exemption from corporate taxes, something that was available at the time to multinationals concentrated on the export market. The country was forced to stop offering the exemptions to companies in 1981 as a part of Ireland's admission to the European Economic Community, although Apple's tax holiday still continued through 1990. 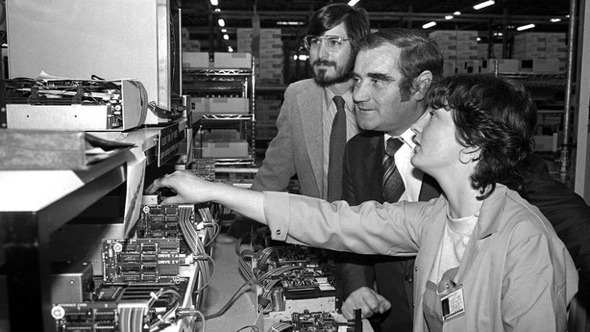 Apple co-founder Steve Jobs visits Apple II manufacturing in Cork, circa October 1980. Irish operations were jeopardized in 1992, when executives decided to lay off hundreds of people as some work was shifted to Singapore — which was offering tax holidays of its own. The Irish government kept Apple in the country by negotiating a new tax arrangement, which calculated the company's income in a way that kept taxes extremely low. Apple's focus in Cork gradually shifted away from manufacturing towards sales and administration. Past decisions have come home to roost. In August 2016 the European Union ordered Ireland to collect billions of dollars in back taxes, arguing that it had offered Apple preferential tax treatment — something illegal under European law — even reverse-engineering rules in Apple's favor. The company was said to have paid just 1 percent on funneled international profits in 2003, and as little as 0.005 percent in 2014. Apple and Ireland are appealing the ruling, but the former has already made its first payment into an escrow account. Another flashpoint in Ireland was the company's attempt to build a data center near the town of Athenry. Originally announced in Feb. 2016, the project was intended to be Apple's first data center in Europe. As time went on however it ran into continued private legal opposition, related to concerns about enviromental impact as well as strain on the Irish power grid. In May 2018 Apple simply scrapped the project altogether, leaving a Danish facility as its only European data center.